© Bissar et al. ; Licensee Bentham Open. This paper aims to explore the assessment of patients with rheumatologic diseases, especially rheumatoid arthritis (RA), before undergoing orthopedic surgery. Perioperative assessment ensures an early diagnosis of the patient's medical condition, overall health, medical co-morbidities, and the assessment of the risk factors associated with the proposed procedures. Perioperative assessment allows for proper postoperative management of complications and of the management of drugs such as disease-modifying anti-rheumatic drugs (DMARD) and anti-platelets, and corticosteroids. The assessment also supports follow up plans, and patient education. Perioperative assessment enables the discussion of the proposed treatment plans and the factors associated with them in each case among the different specialists involved to facilitate an appropriate early decision-making about the assessment and treatment of patients with rheumatologic diseases. It also enables the discussion of both condition and procedure with the patient to ensure a good postoperative care. Keywords: Perioperative management, rheumatologic disease, perioperative risk assessment, perioperative drug management..
Surgical correction for the treatment of musculoskeletal disorders is sometimes imperative, especially in cases of chronic rheumatic diseases. It is vital that perioperative assessment before the surgical procedure goes beyond the usual cardiovascular and pulmonary risk assessments. Proper medical evaluation and care of rheumatologic patients prior to surgery calls for the collaboration between rheumatology and orthopedic surgery to ensure patients get the best possible care. Such cooperation plays a major role in optimizing the effectiveness of perioperative management for patients and in optimizing the overall treatment outcome . Perioperative assessment affects the postoperative care because it identifies the conditions to pay attention to later on. Certain patients may be at an increased risk due to systemic manifestations of the underlying disease, medication effects, specific joint problems, cervical spine instability, exacerbation of their underlying disease and infection. Some drugs, especially disease-modifying anti-rheumatic drugs (DMARDs), corticosteroids, anti-platelet agents and venous thromboembolism (VTE) prophylaxis must also be managed. In the absence of clear guidelines for the care of patients with rheumatic diseases undergoing orthopedic surgery, management must be individualized to bring favorable patient outcomes, reduction in hospital stay, and maximum utilization of resources. Ideally, perioperative medical evaluation should start several weeks before elective surgery but, in some cases, time may not be available for situations requiring emergency surgery, such as in acute fractures . Two classical cases are presented as examples of rheumatological cases undergoing orthopedic surgery. The resolution of the perioperative care of these cases will be presented at the end of the article. The article identifies the components of perioperative medical evaluation, discusses perioperative management of co-morbidities and the management of specific clinical problems related to rheumatoid arthritis (RA) (i.e. cervical spine disease, pulmonary disease), systemic lupus erythematosus (SLE), the management of DMARDs, like methotrexate (MTX) and biologic therapies, VTE prophylaxis, prophylactic antibiotics, and postoperative follow up including patient education and rehabilitation. Case (1): A 51 year-old female, known case of long-standing RA and hypertension on MTX 7.5mg weekly, Prednisolone 5 mg daily, Infliximab 3mg/kgIV every 8 weeks, Lisinopril 10 mg, Amlodipine 5 mg and Aspirin 81 mg. She has disabling deformities in both hands with ulnar deviation and swan neck deformity involving multiple fingers. Hands’ x-rays show extensive peripheral joint erosions bilaterally. The female is scheduled for reconstructive hand surgery. At baseline, she is sedentary and her painful knees limit her level of activity. Case 2: A 55 year-old female, known case of lupus nephritis on daily Mycophenolate2g, Hydroxychloroquine 300 mg and Prednisolone 10mg. She has been admitted to the orthopedic service for a right total hip replacement (THR) due to avascular necrosis of the right hip. History and physical examination: Pre-operative history and physical examination should be comprehensive. Components of the history particularly important to patients with rheumatologic diseases include the patient’s age, duration of rheumatologic disease, current functional status, specific joint involvement, any extra-articular manifestations of disease, current medications including previous use of steroids, previous complications associated with surgery, and any co-morbidities. Special emphasis should be given to musculoskeletal issues during the physical examination, specifically posture, location of joint involvement, gait, and range of motion (ROM) of the examined joints. Furthermore, underlying disease must be diagnosed and the skin should also be examined for any manifestation of underlying rheumatologic disease that impacts skin integrity . Investigations: Although the value of routine pre-operative testing has not been established, the following tests may be considered. A complete blood count for an examination of possible drug related anemia due to gastric or duodenal irritation, leukopenia and/or bone marrow suppression. This is also important in situations where significant blood loss is expected, such as total hip replacement. A renal profile and liver enzymes to screen for anti-rheumatic drugs side effect. A urinalysis and urine culture: for those patients undergoing total joint arthroplasty. A 12-lead electrocardiogram (ECG) is recommended in males over the age 40 and females over 50 having major surgery, even in the absence of history or physical exam findings [4, 5]. Chest x-ray is indicated for patients over the age 50 undergoing major joint or spine surgery, even if there is no evidence suggesting active pulmonary disease . Perioperative assessment of medical co-morbidities: minimization of risks can help decrease surgical morbidity and mortality . Continue most medications through surgery. Continue most anti-hypertensive drugs through surgery with sips of water, or consider non-oral forms [3, 7]. Consider transdermal, IV, or sublingual equivalents. Avoid abrupt withdrawal of beta-blockersand alpha-blockers. It is recommended that diuretics be continued in patients with heart failure, but rapid diuresis before surgery must be avoided [3, 7]. Nitrates should be continued if in use. Perioperative nitroglycerin use for the prevention of adverse ischemic events in high-risk patients may be considered [3, 7]. It is recommended that ACE inhibitors be continued during non-cardiac surgery in stable patients with left ventricular (LV) systolic dysfunction. Continuation of beta-blockers is recommended in patients previously treated with beta-blockers because of ischemic heart disease (IHD), arrhythmias, or hypertension. Beta-blockers should be considered for patients scheduled for intermediate-risk surgery if their blood pressure is not controlled. Heart rate reducing calcium channel blockers, in particular Diltiazem, may be considered before non-cardiac surgery in patients who have contra-indications to beta-blockers [3, 7]. Stop Aspirin and Clopidogril 5-7 days before surgery. Usually may safely resume 24-48 hours postoperatively. Continue Aspirin preoperatively in patients with a history of ischemic heart disease if the type of surgery allows for this. May continue the use of cyclooxygenase-2 (COX2) inhibitors [3, 7, 21]. Most patients can safely have surgery as long as the SBP is less than 180 and DBP is less than 110, and there is no evidence of end organ damage [3, 7]. Patients taking Aspirin and non steroidal anti inflammatory drugs (NSAID) may have a higher risk for developing peri-operative bleeding complications. Continue thyroid supplements with sips of water. Reduce L-thyroxine dose by 20% for long-term parenteral use, if applicable [3, 7]. 1- Intra-operatively: Hydrocortisone 50 mg intravenously. 2- Postoperative day 1: Hydrocortisone 20 mg intravenously every 8 hours for 3 doses. 3- Postoperative day 2: return to preoperative Glucocorticoid dose or parenteral equivalent. The glucocorticoid target is 50 to 75 mg per day of Hydrocortisone equivalent for 1 or 2 days [3, 18]. All patients with type 1 and type 2 diabetes should be transitioned to scheduled subcutaneous insulin therapy at least 1-2 h before discontinuation of continuous insulin infusion. 1-Critically ill patients or those going through major surgery require an intravenous insulin therapy for achieving the desired glucose range of 140-180 mg/dL (7.8 - 10 mmol/L) without increasing risk for severe hypoglycemia. Strict glycemic control in critically ill patient is detrimental by increasing mortality and should be avoided . Prolonged anesthetic effect after surgery may suggest hypothyroidism. All patients with diabetes admitted to the hospital should have their diabetes clearly identified in the medical record, and an order for blood glucose monitoring, with results available to all members of the health care team. A plan for preventing and treating hypoglycemia should be established for each patient to avoid risky situations. Obtaining an A1C on patients with diabetes admitted to the hospital should be considered if the result of testing in the previous 2-3 months is not available [19, 20]. 2-For non-critically ill patients or those undergoing minor surgery, the preferred method for maintaining glucose control is to schedule subcutaneous insulin with basal, nutritional, and correction components. Pre-meal blood glucose targets140 mg/dL (7.8 mmol/l) and random blood glucose180 mg/dL (10.0 mmol/l). 3- Type 2 Diabetes who is controlled with diet usually do not require perioperative therapy, however blood sugars must be checked and short acting insulin as a correction dose may be given. 4- Type 2 Diabetes treated with oral agents or non-insulin injectables should hold their hypoglycemic agents on the morning of surgery. Their blood sugar should be checked and correction dose of short acting insulin may be administered subcutaneously. Glucose must be monitored for all patients and for patients on therapies associated with increased risk for hyperglycemia, including high-dose glucocorticoid therapy. Enteral or parenteral nutrition, or other medications such as Octreotide or immunosuppressive medications must be initiated [19, 20]. Hepatic Malabsorption, dysmotility of bowel, and hepatic dysfunction may significantly alter pharmacodynamics of perioperative medications including anesthetic . Nutritional status and liver disease must be assessed and monitored preoperatively. History of risk factors for hepatitis B or C and history of alcohol use should be determined . Renal Perioperative renal function is the best predictor of postoperative renal failure . Nephrotoxic drugs are to be avoided. Urine volume status, output, adequate perfusion, and drug levels should be monitored if applicable. Less nephrotoxic induction protocols should be used. Nephrology consultation should be considered in patients with worsening renal function or decreased urine output . Patients with chronic kidney diseases (CKD) may have multi-organ dysfunction, general disability, and specific problems associated with renal replacement therapy (RRT). In patients with mild to moderate CKD, surgical trauma and perioperative hemodynamic instability may precipitate acute kidney injury . 1-To be stopped 1-3 days before surgery depending on half-life. 2-They can be started again postoperatively for pain relief. Are to be continued until morning of surgery then decision is up to the anesthesiologist to determine narcotic use intraoperatively. DMARDs see text Patients with severe SICCA syndrome (An autoimmune disease, also known as Sjogren syndrome, that classically combines dry eyes, dry mouth, and another disease of connective tissue such as rheumatoid arthritis (most common), lupus, scleroderma or polymyositis) require lubricant eye drops [7, 18]. Hematologic Anticoagulation can be associated with increased risk of bleeding, especially in the immediate post-operative period. In major orthopedic surgery, physicians should consider low-molecular-weight heparin (LMWH) as venous thromboprophylaxis 12 h prior to surgery and extend to 35 days after surgery [21, 26]. 1- VKAs should be stopped 5 days before surgery. 2-VKAs should be resumed 12 to 24h after surgery when there is adequate homeostasis. 1- The last preoperative dose of LMWH should be administered 24 h before surgery. 2-LMWH can be resumed 48 to 72 h after surgery. 3-Unfractioned Heparin (UFH) should be stopped 4 to 6 hrs before surgery [3, 21]. Patients may have anemia that puts them at risk for requiring blood transfusion during major surgeries associated with significant blood loss. Anemia in RA patients is a common and dynamic condition that may increase the patients risk for myocardial ischemia. Physicians should consider autologous blood transfusion requirements well in advance of surgery [3, 21]. Erythropoietin, with or without iron supplement, is recommended preoperatively in patients with a baseline Hct < 34% to avoid or reduce allogeneic blood transfusion preoperatively [30,31]. Neurologic To continue Anti-convulsion therapy. Treatment with atropine may precipitate delirium in Parkinson's disease . Delirium is a predictor of poor outcome (that is potentially preventable). Formal assessment of preoperative cognitive function can help target prevention efforts by identifying high-risk patients . Miscellaneous Ask about non-prescription drugs and supplements. Alcohol and illicit drug use should be considered possible. Asymptomatic bacteruria in patients undergoing total joint arthroplasty must be treated to avoid risk . Among HIV positive patients, perioperative management should include hands-on pharmacy support . Patient may be unaware of pregnancy. Patients fears and expectations should be explored. The following should be taken into consideration when evaluating patients with rheumatic diseases undergoing orthopedic surgery. Patients with inflammatory arthropathies are at risk of spinal cord injuries when the airway is positioned for intubation. Whether it is the potentially hypermobile rheumatoid neck with atlantoaxial instability, or the immobile neck of the spondylitic process, inappropriate movement of the neck may result in cord injury. Intubation therefore must be accomplished with a minimum of spinal movement . RA patients going for surgery should be evaluated for rheumatoid involvement of the neck. Higher incidence of cervical joint involvement is found in RA patients with long-standing diagnosis, significant peripheral joint erosion, long-term corticosteroid therapy, neck symptoms, erosive disease, subcutaneous nodules and in particular elderly patients. Furthermore, lateral flexion/extension cervical spine films must be considered to evaluate C1-2 stability if a patient is undergoing orthopedic surgery in patients with RA, ankylosing spondylitis (AS), and in any patient with neck pain or crepitus on ROM testing, radicular pain or limb weakness. Consider MRI if plain films are abnormal, and in patients with neurologic symptoms and signs of spinal cord compression [8-11]. Notify the anesthesiologist if the distance between the atlas and odontoid is >2.5 mm. Warranted precautions to avoid neck injury should be considered with a soft cervical collar for immobilization during transport, warning the staff to minimize manipulation and consider alternatives to airway management . As in AS patients with fusion of the cervical vertebrae, neck extension may lead to cervical fracture. These fractures occur most commonly between C5 and C7 and typically extend through the disc spaces, transecting the spinal column. In assessing patients with AS preoperatively, attention should focus on the amount of residual neck motion. Patients with early or non-progressive disease may possess significant mobility. It is important to recognize that as the remaining mobility decreases, the risk of injury increases . Preoperative assessment and screening for cardiac, pulmonary, renal and peripheral vascular diseases in RA patients may lead to enhanced outcomes postoperatively . Similar findings were observed for elderly patients . This is important since a significant number of RA patients are elderly. Special attention should be made to risk stratify RA patients for coronary artery disease. Many factors including accelerated atherosclerosis place RA patients at high risk for cardiac morbidity and mortality . RA patients presenting for orthopedic surgery should receive careful preoperative cardiac risk stratification. Preoperative dipyridamole thallium scintigraphy (DTS) is most useful to stratify selected nonvascular surgery patients at intermediate or high risk by clinical assessment . Multiple pulmonary complications including fibrosis, bronchiolitis, and pleuritis can affect RA patients by interfering with the perioperative course. Serial pulmonary function test (PFT) among patients with RA is recommended, and allows for earlier detection of defected ventalition . Cricoarytenoid arthritis is very common among RA patients and raises concerns of complicated intubation or obstructed airway after surgery. Most patients are asymptomatic but they may present with symptoms like hoarseness, sore throat, or difficult inspiration. Therefore, it is vital to avoid intra operative musculoskeletal trauma in patients with RA by applying generous padding during joint positioning and by avoiding sudden movements of the neck and torso . Steroids: Patients taking steroids and those who have been on steroids for a year before may need perioperative stress doses. In general, limiting minimal doses of steroids preoperatively should be considered to prevent impairment of wound healing and surgical site infections. Chronic use of steroid also increases the potential risk of subversive consequences of an inadequate adrenal response [15, 16]. DMARDs and biologic therapies: For patients with RA, a treatment with immune-suppressive drugs like DMARDs and biologic therapies can improve disease remission and prevent exacerbation of autoimmune inflammatory activity in patients undergoing surgery. However, there is still a question of whether DMARDs and biologic therapies are to be discontinued in RA patients undergoing surgery, and till now there is no well-established data from randomized, double blind controlled clinical trials . MTX: A large, prospective randomized study was undertaken by Grennan et al. that involved 388 patients with RA, which suggested that there was no increased risk of infection or other postoperative complications in patients with RA who continued MTX . However, if there are additional concerns regarding the perioperative safety of MTX such as renal insufficiency, or if a more complex surgical intervention is required, the drug may be withheld the week before and the week after surgery. MTX should be re-instated as soon as the patient is stable postoperatively [17, 18]. If prolonged surgery or artificial respiration is anticipated or in case of pulmonary complications, MTX treatment should be discontinued until full recovery to reduce the risk of pneumonia [17, 19, 20, 21]. While continuation of MTX is most likely safe, data on other DMARDs is sparse. Therefore, more data on the perioperative use of the DMARDs and biologic therapies is needed . Current guidelines developed by various national rheumatic disease societies, such as the American College of Rheumatology (ACR) and the British Society for Rheumatology (BSR); recommend stopping TNF blockers use 1 to 4 weeks before surgery, proportional to the drugs half-lives. Until studies clearly delineate the comorbidities and concurrent medications that contribute to the increase in risk, caution dictates holding these agents preoperatively [22, 23]. The guidelines also suggest that treatment may be restarted postoperatively if there is no evidence of infection, and once wound healing is satisfactory . Infection rates attributed to Tocilizumab are comparable to those associated with other biologic DMARDs. As with other biologic DMARDs, discontinuing Tocilizumab 11 to 13 days before surgery, based on the drug half-life, is a safe approach to perioperative therapy . This oral DMARD is likely to be approved soon for use in RA, and has shown efficacy in control of symptoms and in slowing radiographic progression. Insufficient information is currently available to make recommendations regarding perioperative management . Rituximab has been shown to be safe in patients with prior recurrent bacterial infections. Compared with TNF blockers, Rituximab is associated with a lower risk for bacterial infections, which are the primary concern in perioperative management, although the presence of low immunoglobulin levels in a small proportion of patients raises the infection risk . The risk of infection in patients treated with Abatacept is not significantly increased over baseline non-biologic-treated RA patients. Abatacept is administered either as a monthly infusion or a weekly subcutaneous injection, and conservative timing of surgery should be at the end of the dose cycle . Many perioperative issues must be considered for patients with SLE undergoing orthopedic surgery, such as assessing the risk factors for worse outcomes including: smoking or use of oral contraceptive pills (OCP), adequate blood pressure (BP) and lipid control since patients with SLE undergoing both non-elective and elective hip and knee surgery have a high mortality and morbidity rate compared to RA patients [9, 25]. It is also necessary to assess medication management, and multiple organ involvements: hematologic abnormalities, renal disease, and immune dysfunction, and thromboembolic disease . Moreover, the risk assessment in patients with anti-phospholipid antibody syndrome (APS) should be evaluated preoperatively to decrease the risk of major bleeding and the risk of a thromboembolic event . Management of anticoagulation perioperatively is outlined in Table 1. Total joint arthroplasty, especially in patients with pulmonary hypertension, is considered a risk factor for postoperative venous thrombosis. Meta-analysis showed that VTE extended-duration prophylaxis with low molecular weight heparin (LMWH) or unfractionated heparin in patients with major hip or knee replacement surgery can reduce the risk of symptomatic venous thromboembolism significantly . This benefit is associated with increased risk of minor bleeding, but with no excess major bleeding. DVT prophylaxis is outlined in Table 1. Antibiotic prophylaxis is needed for RA patients who will be undergoing long procedures especially patients with total knee replacement, joint replacement and prosthetic joints to prevent surgical site infections. Antibiotics must also be administered to patients undergoing surgery in an infected area with a high risk of bacteremia. Cefazolin or Cefuroxime are the drugs of choice, and should be given 30 to 60 minutes before skin incision. Vancomycin may be used for patients with a confirmed ß-lactam allergy; it should be started within two hours prior to incision. The dose of antibiotic differs according to patient’s weight; for patients >80 kg the doses of Cefazolin should be doubled. Additional intraoperative doses of antibiotic should be used for prolonged procedures and if there is significant blood loss during the procedure. Wound infection can be prevented after surgical repair of closed fractures by a single dose of cephalosporin. Prophylactic antibiotics should be stopped within 24 hours of the end of surgery [27, 28]. Careful follow up should be obtained for patients with RA and SLE assessing the risk of prosthetic joint infections, VTE and pulmonary embolism as they have greater risk for the development of these complications postoperatively. Hospitalized patients with autoimmune disease have a high risk of postoperative venous thrombosis and can be offered a regional anesthesia, as it reduces the postoperative DVT significantly . Patients with gout should be checked for the risk of flare postoperatively. In patients with Raynaud's phenomenon, hypothermia must be avoided postoperatively and pressure ulcers must also be prevented . The expected duration of movement limitations and options for pain control. Both immediately after the operation and in the following weeks to months. The importance of a comprehensive physical activity program following surgery. The pain control plan. The associated fluctuation of pain with different medication withdrawal or institution must be explained. Possible drug-drug and/or drug-food interactions of new medication regimens with emphasis on the potential risk of anticoagulant drugs, foods affecting potency of Warfarin and any follow up instructions including monitoring of laboratory investigations . The importance of early mobilization . Patients should undergo physical therapy since physical activities are necessary for patients with rheumatologic disease to prevent disabilities, restore function and relive pain. These activities should be evaluated preoperatively to determine consistency with treatment goals which are greatly enhanced by prescribed therapeutic exercises and functional activities. For patients with active inflammatory joint or soft tissue diseases, the therapeutic exercises should be balanced with essential rest periods for a successful treatment, which aims usually at preserving or increasing functional level, decrease pain and joint inflammation, and increase ROM and strength . The summary of perioperative management of patients with rheumatic diseases is outlined in Fig. (1). Summary of perioprative mangment of patients with rheumatic diseases. The optimal care of rheumatologic patients can be conducted perioperatively by a careful review of their clinical conditions through history and physical examination. Identifying co-morbidities is crucial for patient's safety and it results in better outcomes. Risks should be assessed perioperatively. Collaboration between rheumatologists and orthopedic surgeons working together with a multidisciplinary team of physiotherapists and pain management experts is essential for safe perioperative care and optimal surgical outcomes for patients with rheumatologic disease undergoing orthopedic surgeries. Moreover, Patients with RA and SLE should be assessed for other potential risks. Patients on DMARDs and biologic therapies present a serious concern perioperatively. DMARDs are commonly used as immunosuppressive agents in many autoimmune diseases. The immunosuppressive effects of these drugs raise the concern of postoperative complications especially with orthopedic surgery, which is common in chronic rheumatologic patients. This patient was a 51 year-old female, a known case of long-standing RA and hypertension. She had significant small joint involvement that caused disabling deformities in both hands with ulnar deviation and swan neck deformity involving multiple fingers. Hand x-rays revealed extensive peripheral joint erosions bilaterally. At baseline, she was sedentary because her painful knees limited her level of activity. She was on MTX 7.5mg weekly, Prednisolone 5 mg daily, Infliximab 3mg/kg IV every 8 weeks, Lisinopril 10 mg. Amlodipine 5 mg and Aspirin 81 mg. She was scheduled for reconstructive hand surgery. The female was screened for C1-2 subluxation. Intraoperatively, it is important to avoid musculoskeletal trauma. Therefore, padding, careful joint positioning and avoidance of sudden movements of the neck and torso are important to prevent injury, including neurovascular compromise or fracture. PFT was indicated to screen for pulmonary fibrosis, given the severity of rheumatoid arthritis. She was instructed to stop Aspirin 1 week before Anti-hypertensive medications continued with sips of water perioperatively. Methotrexate was suggested to continue, with no increased risk of infection, wound healing or flare. Infliximab, an anti-TNF blocker was with held one week before and re-started at least one week after surgery. If Infliximab was being administered every 8 weeks, it was surgery. Anti-hypertensive medications were continued with sips of water perioperatively. MTX was continued, with no increased risk of infection, wound healing or flare. Infliximab, an anti-TNF blocker was held one week before and re-started at least one week after surgery. If Infliximab was being administered every 8 weeks, it was recommended that this elective surgery be scheduled in the middle of the eight-week period. With regards to Prednisolone, as the patient had only been taking 5mg/day of Prednisolone daily, there was no need to screen for suppression of her hypothalamic-pituitary-adrenal axis, nor to administer stress doses of steroids. The current dose was continued perioperatively. Since this was a clean procedure of relatively short duration, prophylactic antibiotics were not indicated. Early ambulation was adequate for VTE prophylaxis. This patient is a 55 year-old female, known case of lupus nephritis on Mycophenolate 2g daily, Hydroxychloroquine 300 mg daily and Prednisolone 10mg daily. She was admitted to the orthopedic service for a right total hip replacement due to avascular necrosis of the right hip. The patient was on Prednisolone more than 5mg/d chronically and was scheduled to undergo a moderate stress procedure, thus stress dose steroids in the form of Hydrocortisone 50 mg IV, then postoperatively 20mg IV every 8 hours for 3 doses, then pre-operative dose was resumed on post-operative day 2. Furthermore, THR is a major surgery, thus the patient required a chest x-ray, ECG and persantine thallium for pulmonary and cardiac screening. Hydroxychloroquine and mycophenolate were continued to the morning of surgery, and resumed with oral intake and because SLE patients who have renal involvement and are on steroids are considered to be at higher risk for developing perioperative complications. Screening laboratory investigations should include CBC, renal profile and urinalysis. If the patient is found to be anemic, preparations for autologous blood donation including iron and erythropoietin may be appropriate, as substantial blood loss often occurs perioperatively. Even an asymptomatic urinary tract infection should be treated before proceeding with THR. Dual VTE prophylaxis was recommended to be initiated, preferably with LMWH at least 12 hours before surgery and extended to 35 days after; intermittent pneumatic compression device was recommended to be used during the hospital stay along with perioperative antibiotics, such as IV Cefazolin. We are grateful for the support and funding from Alzaidi Chair of Research in Rheumatic Diseases, Umm Alqura University, Makkah, Saudi Arabia. The authors would also like to thank Dr. Khadijah Bawazeer for editing the manuscript. Beary JF, Christian CL, Johanson NA, Eds. Hospital for Special Surgery.Dept. of Orthopedic Surgery. Manual of rheumatology and outpatient orthopedic disorders: diagnosis and therapy Boston: LitleBrown. 2nd ed.. 1987. Walker J. Care of patients undergoing joint replacement Nurs Older People 2012; 24(1 ): 14-20. MacKenzie CR. Perioperative Medical Care of Rheumatic Disease Patients Having Orthopaedic Surgery Available from http: //wwwhssedu/professional-conditions_perioperative-medical-care-of-rheumatic-disease-patients-having-orthopaedic-surgeryasp 2004. Kannel WB, Abbott RD. Incidence and prognosis of unrecognized myocardial infarction.An update on the Framingham study N Engl J Med 1984; 311(18 ): 1144-7. Silvestri L, Maffessanti M, Gregori D, Berlot G, Gullo A. Usefulness of routine pre-operative chest radiography for anaesthetic management: a prospective multicentre pilot study Eur J Anaesthesiol 1999; 16(11 ): 749-60. Lee TH, Marcantonio ER, Mangione CM, et al. Derivation and prospective validation of a simple index for prediction of cardiac risk of major noncardiac surgery Circulation 1999; 100(10 ): 1043-9. Bushnell BD, Horton JK, McDonald MF, Robertson PG. Perioperative medical comorbidities in the orthopaedic patient J Am Acad Orthop Surg 2008; 16(4 ): 216-7. Crosby ET, Lui A. The adult cervical spine: implications for airway management Can J Anaesth 1990; 37(1 ): 77-93. Wong C, Ed. The Medicine Consult Handbook 2011. Vieira EM, Goodman S, Tanaka PP. Anesthesia and rheumatoid arthritis Rev Bras Anestesiol 2011; 61(3 ): 367-75. Kwek TK, Lew TW, Thoo FL. The role of preoperative cervical spine X-rays in rheumatoid arthritis Anaesth Intensive Care 1998; 26(6 ): 636-41. Jin F, Chung F. Minimizing perioperative adverse events in the elderly Br J Anaesth 2001; 87(4 ): 608-24. Abraham SA, Eagle KA. Preoperative cardiac risk assessment for noncardiac surgery J Nucl Cardiol 1994; 1(4 ): 389-98. Matti MV, Sharrock NE. Anesthesia on the rheumatoid patient Rheum Dis Clin North Am 1998; 24(1 ): 19-34. Akkara Veetil BM, Bongartz T. Perioperative care for patients with rheumatic diseases Nat Rev Rheumatol 2012; 8(1 ): 32-41. Coblyn JS. Infections. dugs.and rheumatoid arthritis. What have we learned? J Rheumatol 2008; 35(3 ): 375-6. Lee MA, Mason LW, Dodds AL. The perioperative use of disease-modifying and biologic therapies in patients with rheumatoid arthritis undergoing elective orthopedic surgery Orthopedics 2010; 33(4 ): 257-62. Grennan DM, Gray J, Loudon J, Fear S. Methotrexate and early postoperative complications in patients with rheumatoid arthritis undergoing elective orthopaedic surgery Ann Rheum Dis 2001; 60(3 ): 214-7. Harle P, Straub RH, Fleck M. Perioperative management of immunosuppression in rheumatic diseases what to do? Rheumatol Int 2010; 30(8 ): 999-1004. Loza E, Martinez-Lopez JA, Carmona L. A systematic review on the optimum management of the use of methotrexate in rheumatoid arthritis patients in the perioperative period to minimize perioperative morbidity and maintain disease control Clin Exp Rheumatol 2009; 27(5 ): 856-62. Scanzello CR, Figgie MP, Nestor BJ, Goodman SM. 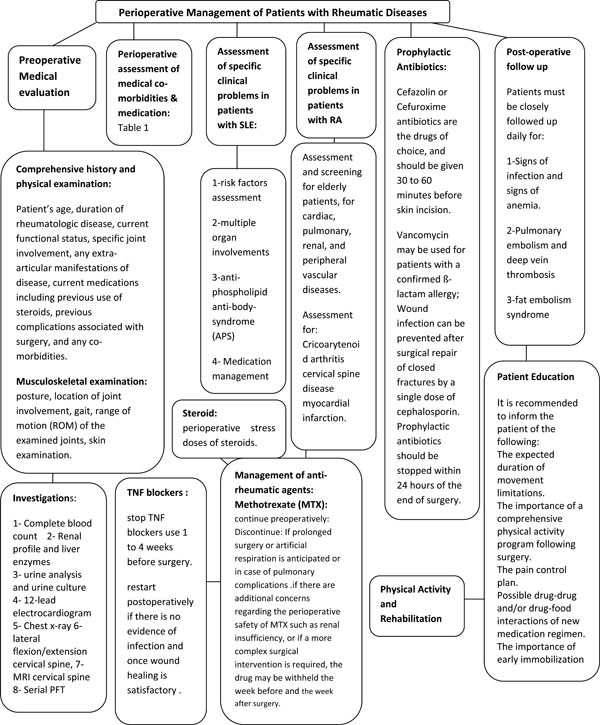 Perioperative management of medications used in the treatment of rheumatoid arthritis HSS J 2006; 2(2 ): 141-7. L. del Olmo BH, Galindo-Izquierdo M, Tébar D, Balsa A, Carmona L. Perioperative management of disease modifying anti-rheumatic drugs: Recommendations based on a meta-analysis pubmed.Revista Espaola de Ciruga Ortop dica y Traumatologa (English Edition) Rev Esp Cir Ortop Traumatol 2012; 56(5 ): 393-412. Goodman SM, Paget S. Perioperative drug safety in patients with rheumatoid arthritis Rheum Dis Clin North Am 2012; 38(4 ): 747-59. Goh L, Jewell T, Laversuch C, Samanta A. Should anti-TNF therapy be discontinued in rheumatoid arthritis patients undergoing elective orthopaedic surgery?A systematic review of the evidence. Rheumatol Int 2012; 32(1 ): 5-13. Eikelboom JW, Quinlan DJ, Douketis JD. Extended-duration prophylaxis against venous thromboembolism after total hip or knee replacement: a meta-analysis of the randomised trials Lancet 2001; 358(9275 ): 9-15. Shammash J. Perioperative management of rheumatic disease American college of physicians [serial on the Internet] 2011 . American Academy of Orthopaedics (AAOS) Advisory Statement. Recommendations for the use of intravenous antibiotic prophylaxis in primary total joint arthroplasty Available at: http: //wwwaaosorg/about/papers/advistmt/1027asp [Accessed 25 June 2012= 2004. Standards of medical care in diabetes--2013 Diabetes Care 2013; 36 ((Suppl 1) ): S11-66. Poldermans D, Bax JJ, Boersma E, et al. uidelines for pre-operative cardiac risk assessment and perioperative cardiac management in non-cardiac surgery: the Task Force for Preoperative Cardiac Risk Assessment and Perioperative Cardiac Management in Non-cardiac Surgery of the European Society of Cardiology (ESC) and endorsed by the European Society of Anaesthesiology (ESA) Eur J Anaesthesiol 2010; 27(2 ): 92-137. Eikelboom JW, Hirsh J, Spencer FA, Baglin TP, Weitz JI. Antiplatelet drugs: Antithrombotic Therapy and Prevention of Thrombosis. 9th ed: American College of Chest Physicians Evidence-Based Clinical Practice Guidelines Chest 2012; 141(2 Suppl): e89S-119S. Koulouvaris P, Sculco P, Finerty E, Sculco T, Sharrock NE. Relationship between perioperative urinary tract infection and deep infection after joint arthroplasty Clin Orthop Relat Res 2009; 467(7 ): 1859-67.